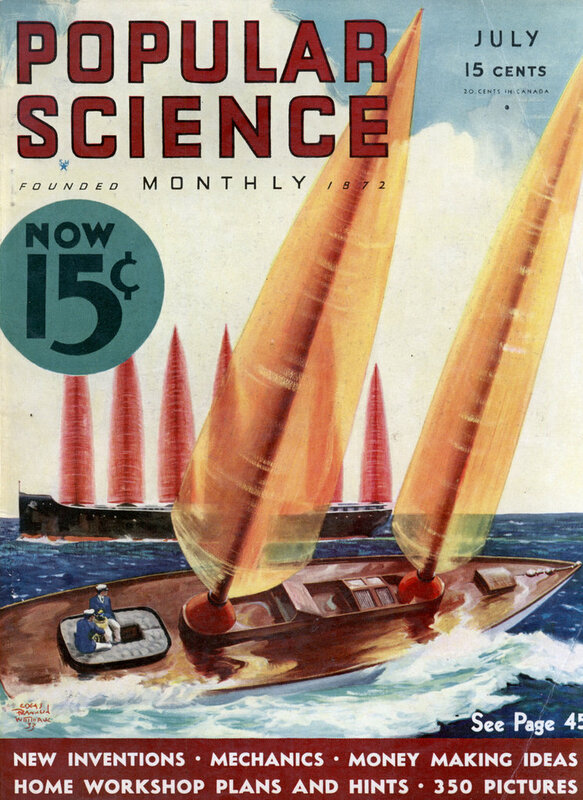 Among other innovations this article is one of the earliest references I have to stereo or surround sound, what they call “auditory perspective”. This is another article that goes further in depth about surround sound. 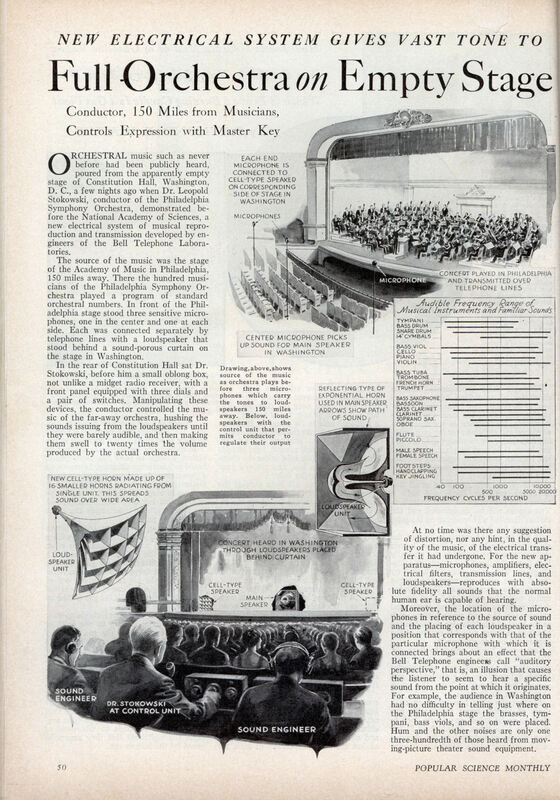 ORCHESTRAL music such as never before had been publicly heard, poured from the apparently empty stage of Constitution Hall, Washington, D. C, a few nights ago when Dr. Leopold Stokowski, conductor of the Philadelphia Symphony Orchestra, demonstrated before the National Academy of Sciences, a new electrical system of musical reproduction and transmission developed by engineers of the Bell Telephone Laboratories. The source of the music was the stage of the Academy of Music in Philadelphia, 150 miles away. There the hundred musicians of the Philadelphia Symphony Orchestra played a program of standard orchestral numbers. In front of the Philadelphia stage stood three sensitive microphones, one in the center and one at each side. Each was connected separately by telephone lines with a loudspeaker that stood behind a sound-porous curtain on the stage in Washington. In the rear of Constitution Hall sat Dr. Stokowski, before him a small oblong box, not unlike a midget radio receiver, with a front panel equipped with three dials and a pair of switches. Manipulating these devices, the conductor controlled the music of the far-away orchestra, hushing the sounds issuing from the loudspeakers until they were barely audible, and then making them swell to twenty times the volume produced by the actual orchestra. At no time was there any suggestion of distortion, nor any hint, in the quality of the music, of the electrical transfer it had undergone. For the new apparatusâ€”microphones, amplifiers, electrical filters, transmission lines, and loudspeakersâ€”reproduces with absolute fidelity all sounds that the normal human ear is capable of hearing. Moreover, the location of the microphones in reference to the source of sound and the placing of each loudspeaker in a position that corresponds with that of the particular microphone with which it is connected brings about an effect that the Bell Telephone engineers call “auditory perspective,” that is, an illusion that causes the listener to seem to hear a specific sound from the point at which it originates. For example, the audience in Washington had no difficulty in telling just where on the Philadelphia stage the brasses, tympani, bass viols, and so on were placed. Hum and the other noises are only one three-hundredth of those heard from moving-picture theater sound equipment.